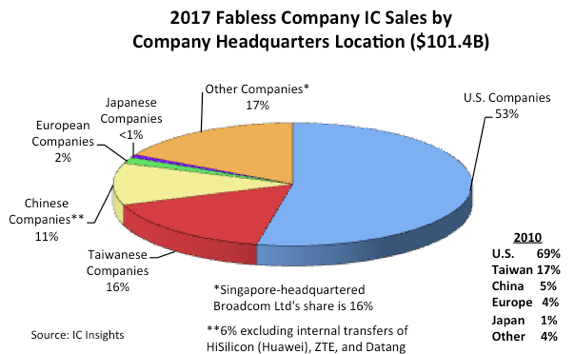 Research included in the March Update to the 2018 edition of IC Insights’ McClean Report shows that fabless semiconductor suppliers accounted for 27% of the world’s semiconductor sales in 2017—an increase from 18% ten years earlier in 2007. 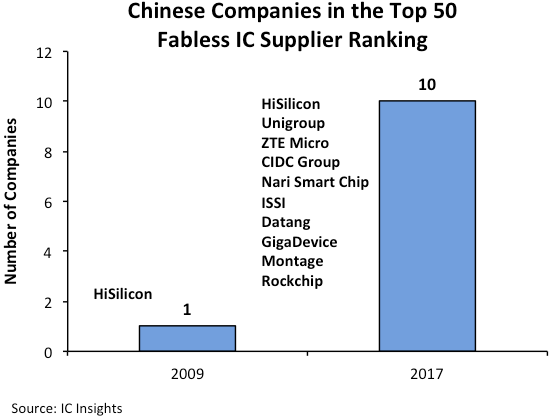 As the name implies, fabless semiconductor companies do not operate an semiconductor fabrication facility of their own. Additional details on fabless IC company sales and other trends within the IC industry are provided in the March Update to The McClean Report—A Complete Analysis and Forecast of the Integrated Circuit Industry (released in January 2018). A subscription to The McClean Report includes free monthly updates from March through November (including a 250+ page Mid-Year Update, and free access to subscriber-only webinars throughout the year. An individual-user license to the 2018 edition of The McClean Report is priced at $4,290 and includes an Internet access password. A multi-user worldwide corporate license is available for $7,290.